I am going to share with you a strategy that has helped me to make money the past year. It conflicts with most of the truisms that we have been taught about the market. But if we trade like most people do, than we can expect to have the results most have— to not make money. One has to pursue one’s own ideas to be successful trading. So, first note that the title to this post involves finding stocks that will appreciate $25 in a month, and not a percentage increase. I have been told by many, and it is mathematically true, that a rise from $5 to $10 is the same percentage increase as a stock that goes from $50 to $100. But psychologically, I find it easier to trade a stock that is rising $50 on the way to a double, than a stock that must go up $5 to double. In other words, it is not the percentage move that I am after, it is the number of points in the rise. Let’s assume for this discussion that the typical stock that breaks out of a base goes up 20% before it consolidates or reverses. A 20% move in a $10 stock is only $2, but it is $20 in a $100 stock. I have more time (at least psychologically) and courage to add to a position in a stock that is rising for $20 than to one that is only on the way to a $2 rise. So I want to hop on board a stock that is breaking from a base or support and that is likely to advance $20+ if I am right. How do I find such stocks? Well, I used TC2000 to look at all stocks that advanced $25 or more in the past 30 days. I found 21 stocks as of Friday. The most consistent characteristic of these stocks was that 90% (19/21) were priced at $80 or more 30 days ago; 17 were greater than $100 per share. I have done this analysis before and it always comes out the same. Most stocks that rise $20 or $25 or more in the past 30 days were above $80 at the beginning of the period. During this period, GOOG rose +$101, AAPL +$61 and ISRG +$63. So, if I want to ride a stock that will advance a lot of points, I should be looking at stocks that are already expensive, more than $80 per share. Other reasons I like expensive stocks is that the in and out high frequency day-traders are less likely to have the money to play with these stocks. And expensive stocks are there for a reason, people, mainly funds, are bidding them up. So, trading expensive stocks may be a fine strategy, but many people, you say, cannot buy many shares of an $80+ stock. This is true, but the missing ingredient is deep in the money (DITM) call options. I use DITM call options to buy expensive stocks for 10%-20% of the cost of the stock. What I do is to find an expensive stock that I think is bouncing off of support or breaking out. Once I find one, I look for a near month call option that has 3-6 weeks before expiration and which will cost me under 20% of the price of buying the stock. This example should illustrate the strategy. 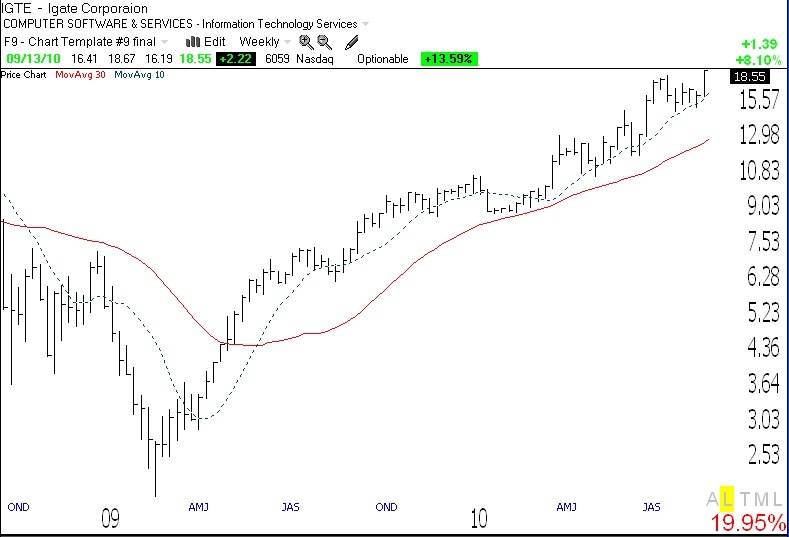 If I believe that NFLX, which closed Friday at $276.58, is in an up-trend and bouncing off of support, I go to yahoo.com and look up the August call options. I find that the August 230 call can be bought for about $49 per share, or $4900 (each option covers 100 shares). This option would give me the right, but not the obligation, to purchase 100 shares of NFLX at $230 each through August 19. Since I am paying $49 per share for the options, if I were to use the option to buy the shares, my cost or break even point is $279 (230+49), just about $2.50 above the current price of NFLX. (With a DITM option the break even price is close to the current price of the stock.) Once NFLX rises above $279, I make $100 per point, just as if I owned the 100 shares of stock. If NFLX rises $25 to around $301 per share before the option expires in August, my profit would be about $2200 (301-279 x 100). And I never have to buy the 100 shares of NFLX because I could now sell the option that I bought for $49 for the price of $71 (301-279). So what we have manged to to with a DITM call option that cost $4900 is to control 100 shares of NFLX, which would have cost $27,658. In a sense, we only had to put down and risk about 18% of the price of the stock. I say risk, because it is accurate. If I bought the 100 shares of NFLX and it fell to zero, I could lose the entire cost, $27,658. But with a call option, the most I could lose is the $4900 that I paid for the option. If the stock is below the strike price, $230, at expiration, it expires worthless. But I would never wait for that to occur. If NFLX declines below support. I would just sell the option at the best price available at the time. For example, if on August 19, NFLX is trading around $270 per share, my option would trade for about $40 (270-230 strike). In other words, at expiration someone would use the option to buy 100 shares of NFLX at $230 and be able to sell the stock immediately in the market for the current price of around $270, a $40 per share profit. So this all comes down to that, all other things being equal, if one wants to buy a stock with a better chance of appreciating many dollars during the next month, it is preferable to buy a very expensive stock by using DITM call options. Chapter 7 of Jim Cramer’s latest book, Getting Back to Even, gives some examples of the uses of DITM call options. I assign Michael Sincere’s book, Understanding Options, to my students who want an options primer……. 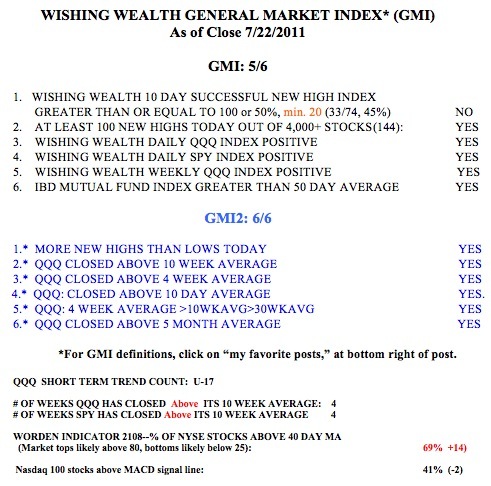 The GMI closed the week at 5 and the GMI2 at 6. So I am comfortable being long. It looks like the money is rotating into tech stocks again, so I own QLD as a way of riding this trend. QLD is a leveraged ETH that aims to rise or fall each day twice as much as the QQQ, or Nasdaq 100 index. Once the short term trend changes, I slowly accumulate QLD (for up-trends) or QID (for down-trends). On Friday the QQQ completed its 17th day of the short term up-trend. The QQQ and SPY have now closed above their critical 10 week averages for 4 weeks. I try to trade consistent with the market’s direction, and to ignore all other factors, including the news and politics. The market has a mind of its own and I msut trade in synch with it. Where are we in the market cycle? Riding the up-trend. I used my favorite indicators to review the Dow 30 Index’s action since 1915, as this is how far back TC2007 allows me to track this index. I looked at the monthly chart and the following indicators: 5 and 30 month simple moving averages and the 25.4.4 monthly stochastic. 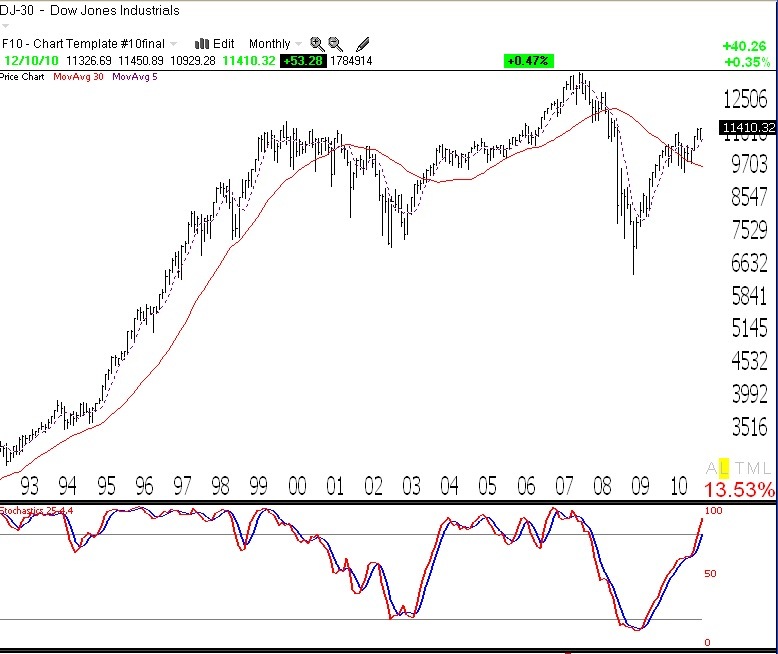 I am posting a chart of the Dow 30 since late 1992. A few patterns leap out at me. 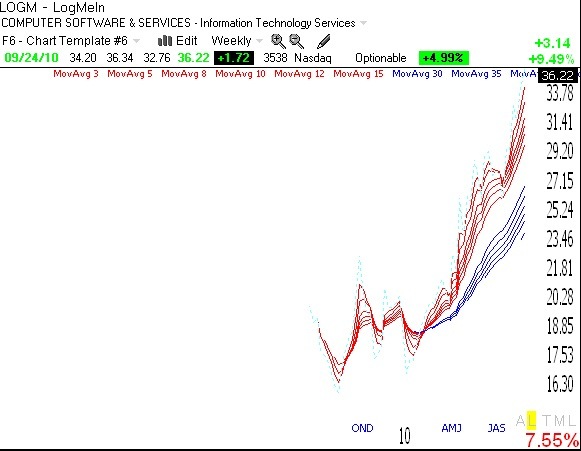 First, notice how the Dow spent most of the time in the roaring 90’s up-trend above the rising 30 month moving average (red line) and with the 5 month average (dotted line) rising above the 30 month average. (Click on chart to enlarge.) The stochastic (in the lower window) with two exceptions, spent almost all of the time above the 80% “overbought” level (top parallel line), until it began a steady decline in 1999, foreshadowing the major decline in the Dow. The 5 month average declined below the 30 month average. The bear market bottomed out with the Dow below the declining 30 month average and with the stochastic around oversold territory, near 20% (bottom parallel line). The market turned up, the 5 month average rose above the 30 month average and the stochastic returned to near 80% again. 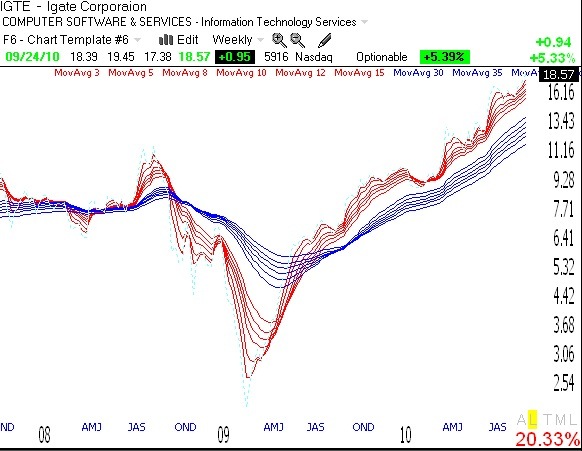 In 2008, the process repeated itself, with the 5 month turning down below the 30 month average and the stochastic declining until it became very oversold again, around 20%. The market has now rebounded, the 5 month average is rising nicely above the 30 month average and the stochastic has just returned to overbought territory, an area where it has stayed for years in some previous rising markets. So where are we in the current cycle? It looks like we are in a strong up-trend with no sign of any weakening yet. In fact, the 30 month average has not yet reversed up, but the 5 month average is moving up nicely above it. Now I have learned in trading over the past 40 years that patterns are meant to be broken. The road is littered with the carcasses of Ph.D.’s who wagered heavily and lost, based upon complicated mathematical relationships that worked in the past. I can tell you that the simple patterns I have discussed below seem to me to have worked well over the past 95 years. 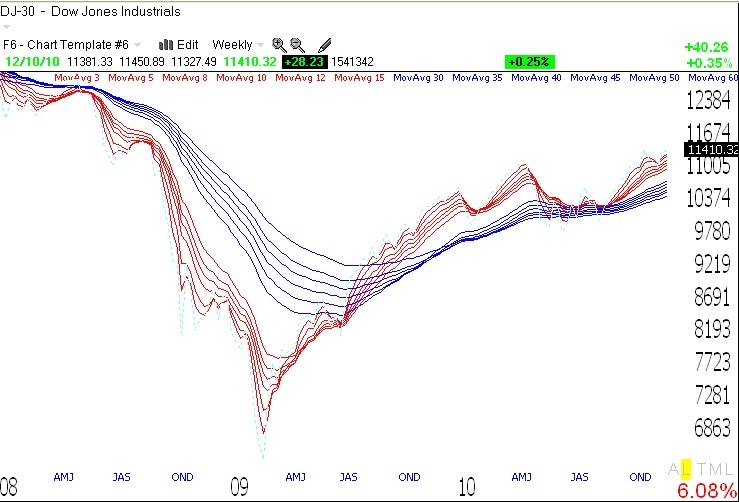 Major bottoms in the Dow have occurred with this stochastic below 50% and the more severe ones, around 20%. So, I won’t begin to suspect the end of the current up-trend until I see the stochastic turn down and the 5 month average decline below the 30 month average. I’ll let you know when that happens……. 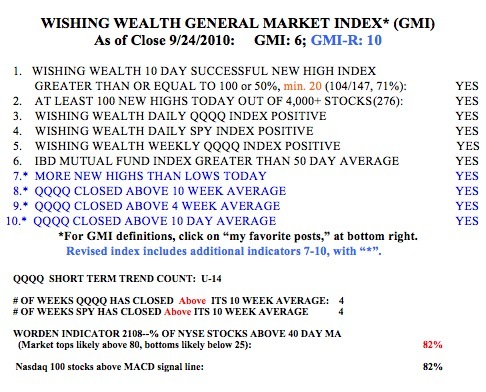 Meanwhile, my General Market Indicator (GMI) remains at the maximum reading (6 of 6) and the more sensitive GMI-R is at 10 (of 10). Thus, all of my short term and longer term indicators for the QQQQ (Nadaq 100 tech stocks), and the SPY (S&P 500 stocks) remain positive. 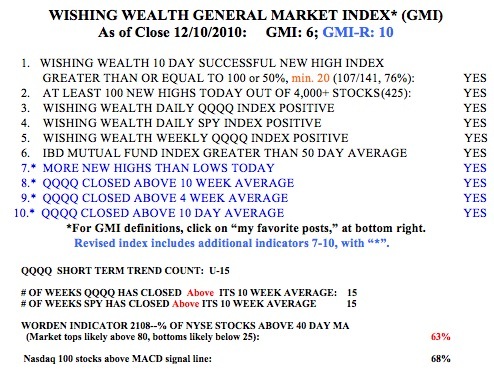 The QQQQ and SPY have closed above their critical 10 week averages for 15 straight weeks. 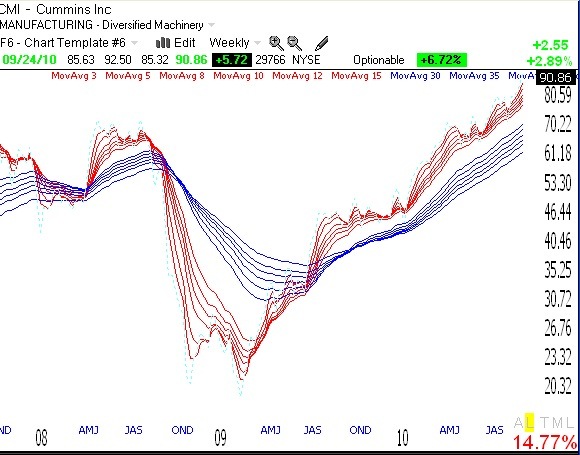 However, Friday was only the 15th day of the QQQQ short term up-trend. The Worden T2108 Indicator is at 63%, in neutral territory. And 68% of the Nasdaq 100 stocks closed with their MACD above its signal line, a sign of short term strength. The weekly GMMA chart below shows that all of the short term averages (red) are above the rising longer term averages (blue), reflecting an established up-trend. So with my more conservative funds, I am adding to my positions in the major index ETF’s like QLD, SPY and DIA, a comfortable way for me to ride the up-trend. I identified the beginning of the new QQQQ short term up-trend on September 7th. The GMI on that day registered 5 (of 6). One of the lessons I learned from the great Nicolas Darvas is to use one’s own judgment and to insulate oneself from the news, media pundits and other traders. He learned this lesson when he returned to NYC after making a lot of money trading while he danced around the world, only to find that he lost his objectivity and his ability to trade profitably when he was in NYC around other traders. By definition, when a new up-trend is beginning, most people will be expecting a continuation of the current down-trend or flat pattern. In early September, when the GMI was flashing a buy signal, most people were talking about a double dip or head and shoulders top. The key to being on the right side of the market is to observe closely what the market is doing. I therefore fly on instrument and tune out everything else. Remember, Darvas used to get Barron’s in the mail and proceed to rip out all of the pages except the stock quotations. Speaking of rockets, I have coined the term Red White and Blue as a simple way of characterizing the weekly chart pattern of promising rocket stocks. I derived this term from one of my students from last year (Marcus) who labeled three moving averages with these colors and wanted the red average to be above the white average, followed by the blue average. I am applying these colors to weekly GMMA charts a little differently, where the red lines are the shorter term averages and the blue lines are the longer term averages. The key to a rocket stock is the presence of a white space between the rising short and long term averages. It is this white space that shows me that the stock is likely to be a rocket. This pattern is universally applicable to rocket stocks. Below are two examples. (Click on charts to enlarge.) In the future I will be discussing Red White and Blue (RWB) stocks. Note that a submarine stock is the opposite (BWR), with the shorter term averages below the longer term averages. In fact, CMI is a great example of a submarine stock that has transformed itself into a rocket. Another RWB stock that came up in my Darvas scan is LOGM, which has been on fire since March. While I never know how long a trend will last and must always manage the risk of a change in trend, if I am going to own a stock, I want it to be RWB on a weekly chart. Finally, IGTE shows that a stock can remain RWB for a long time. The key is to get on board and to sit tight, much as the great Jesse Livermore advised. If one has the patience to ride a RWB stock for a year, one can calmly let his/her account grow, without excessive day trading and the accompanying stress that frequent trading creates. I urge my students to paste copies of these stocks to their computer monitors and to compare all potential purchases to them. Accept no less! As a tribute to the Thanksgiving Holiday, I thought I would share with my readers the trading philosophy I have developed over the years. It is based on my 40+ years of experience in the market and the insights achieved from my voracious reading about the market during that period. My philosophy is based on my interpretation of such great market seers as Darvas, Weinstein, O’Neil, The Turtles, and of course, the greatest trader, Jesse Livermore. (The books written by or about these persons appear in the lower section of my blog). Anyway, I hope you find these propositions useful and would value your additions and comments. A version of these remarks was published under the pseudonym Sir Silent Knight, as part of the Worden TC2007 daily journal. No one can consistently predict changes in the market or stocks. Human behavior is largely unpredictable and no one can predict world and economic events or the reactions to them. Similarly, corporate events and news can be inaccurate or intentionally misleading. Proposition 2. However, stocks and markets often continue in trends that can last weeks or months or longer. Trends form identifiable patterns, probably because humans react to trend patterns in repeatable ways. For example, people often trade off of support or resistance levels or at new highs or lows. While trends can be discerned once started, their length and continuation are also unpredictable. Proposition 3. Given Propositions 1 and 2, oneâ€™s success in the market depends on identifying trends once they have begun and staying with them until they end. But if the length and size of trends are unpredictable, each trade may or may not work out; the likelihood that any given trade will be profitable is unknown. Some successful traders have asserted that only about 50% of their trades are profitable. Proposition 4. If only 50% of trades will be profitable, then to prosper, the profits from winning trades must be considerably larger than the losses from losing trades. One can accomplish this goal by limiting the losses on losing trades and by maximizing the profits on winning trades. One can limit losses by setting stop losses and by making small initial trades. One can increase profits by riding the trend as long as possible AND by systematically increasing oneâ€™s position as the trend continues. Proposition 5. Given Propositions 1-4, trading success is mostly determined by oneâ€™s strategy for exiting the trade rather than the strategy for entry. Since one does not know at entry whether a trade will be profitable, one could probably select stocks at random as long as losses are kept at a minimum and profits are maximized. However, systematic entry and exit rules based on technical analysis can improve the likelihood of a profitable trade. For example, most stocks follow the general marketâ€™s trend, and trading consistent with that trend can enhance oneâ€™s likelihood of success. Nevertheless, given the considerable uncertainty accompanying all trades, the highest priority must be given to the rules for exiting the trade. If one enters each trade assuming that it will fail, one will be better prepared to handle losses. It is the traderâ€™s job to use technical analysis to develop trading rules that function consistent with these propositions. My blog, wishingwealthblog.com, documents my pursuit of this goal. Read moreWhy search for individual stocks when we can ride the ultra ETF’s?